SINGAPORE (Reuters) – In today's so-called smart home, you can dim the lights, order more toothpaste or tell the kids to go to bed simply by talking to a small Wifi-connected speaker, such as Amazon's Echo or Google's Home. This voice-first market - combining voice with artificial intelligence (AI) – barely existed in 2014. This year, Voice Labs, a consultancy, expects 24.5 million appliances to be shipped. Other big tech firms have their own plans: Apple is taking its Siri voice assistant beyond its mobile devices to PCs, cars, and the home; Baidu last month bought Raven, billed as China's answer to Amazon's Alexa intelligent personal assistant; and Samsung Electronics plans to incorporate Viv, its newly acquired virtual assistant, into its phones and home appliances. But not everyone thinks the future of communicating with the Internet of Things needs to be vocal. Facebook founder Mark Zuckerberg, for example, was working on Jarvis, his own voice-powered AI home automation, and found he preferred communicating by text because, he wrote, "mostly it feels less disturbing to people around me." 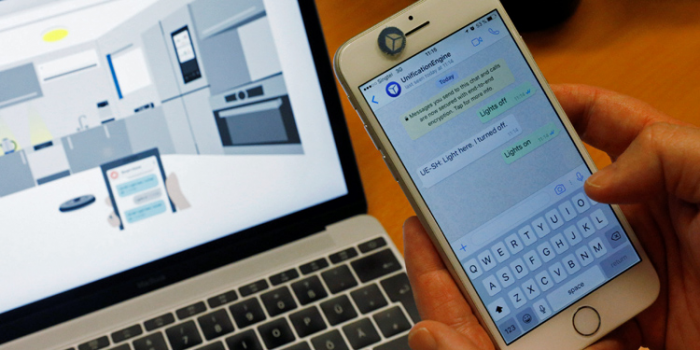 And several major appliance makers have turned to a small Singapore firm, Unified Inbox, which offers a service that can handle ordinary text messages and pass them on to appliances. With your home added to the contacts list on, say, WhatsApp, a quick text message can "start the coffee machine"; "turn on the vacuum cleaner at 5 p.m."; or "preheat the oven to 200 degrees at 6.30 p.m."
"Think of it as a universal translator between the languages that machines speak... and us humans," said Toby Ruckert, a German former concert pianist and now Unified Inbox's CEO. The company is just a small player, funded by private investors, but Ruckert says its technology is patent-backed, has been several years in the making and has customers that include half of the world's smart appliance makers, such as Bosch. Unified Inbox connects the devices on behalf of the manufacturer, while the consumer can add their appliance by messaging its serial number to a special user account or phone number. It so far supports more than 20 of the most popular messaging apps, as well SMS and Twitter and controls appliances from ovens to kettles. Other home appliances being tested include locks, garage openers, window blinds, toasters and garden sprinklers, says Ruckert. "People aren't going to want a different interface for all the different appliances in their home," says Jason Jameson, of IBM, which is pairing its Watson AI supercomputer with Unified Inbox to better understand user messages. They will this week demonstrate the service working with a Samsung Robot Cleaner. "The common denominator is the smartphone, and even more common is the messaging app," Jameson notes. There's another reason, Ruckert says, why more than half of the world's smart appliance manufacturers have signed up. They're worried the big tech companies' one-appliance-controls-all approach will relegate them to commodity players, connecting to Alexa or another dominant platform, or being cast aside if Amazon moves into making its own household appliances. "Our customers are quite afraid of the likes of Amazon," Ruckert said. "Having a Trojan horse in a customer's home, like Echo, that they must integrate with to stay competitive is a nightmare for them." An Amazon spokesperson said the company was "excited by the early response by smart home device manufacturers and even more excited by the customer response," but declined to speculate about future plans. A spokesperson for Bosch said no single company can knit the Internet of Things together, so "there is a need to collaborate and establish ecosystems," such as working with Unified Inbox. Already the race is on to incorporate other services into these home hubs. Amazon allows third parties to develop apps, or "skills", for Alexa. It has more than 10,000 of these, with many added in just the past three months. Most are developed by firms using Amazon's software toolkit, and range from telling jokes to ordering food. And Amazon makes it easy for other hardware makers to incorporate Alexa into their appliances, increasing its reach. Chinese device maker Lenovo has embedded Alexa in its speakers, while General Electric has it in a lamp – meaning users can control these devices by voice, and use them to order products from Amazon. LG Electronics and Huawei are also working on Alexa-enabled devices, Amazon said. Text messaging, though, may yet break down those walls. As Zuckerberg noted, the volume of text messages is growing much faster than the number of voice calls. "This suggests that future AI products cannot be solely focused on voice, and will need a private messaging interface as well," he says. Some companies are already looking further ahead, and doing away with the need for any human instruction – whether by voice or text – by making machines smarter at learning our habits and anticipating them. LG, for example, is using deep learning to make its appliances understand and avoid objects in a room, or fill an ice-tray based on a user's cold drink habits. At Unified Inbox, Ruckert looks ahead to being able to communicate not only with one's own appliances, but with machines elsewhere. Bosch executives in Singapore, for example, have demonstrated how a user could ask a smart CCTV camera how many people were in a particular room. Ruckert is also working with Singapore's Nanyang Polytechnic to send updates to family members or staff direct from hospital equipment attached to patients. And smart appliance entrepreneur James Dyson said in a recent interview that the future lies in what he calls "highly intelligent automation". "For me, the future is making everything happen for you without you being particularly involved in it."